– for mild thematic material, some action/peril and smoking. Twelve-year-old Hugo lives in the walls of a busy Paris train station, where his survival depends on secrets and anonymity. But when his world suddenly interlocks with an eccentric girl and the owner of a small toy booth in the train station, Hugo’s undercover life, and his most precious secret, are put in jeopardy. When I first heard that acclaimed director Martin Scorsese was making a children’s film, I have to admit I was quite surprised. Seeing his name tacked on to the trailer for Hugo seemed bizarre for a director best known for his films The Departed, Goodfellas, Shutter Island and Taxi Driver. But after watching Hugo, I can completely understand why a filmmaker like Scorsese would want to do a movie like this one. And his treatment of the material is nothing short of wonderful. 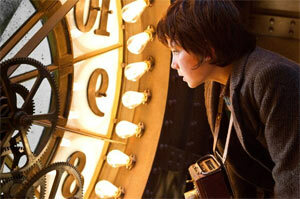 Hugo is adapted from a children’s book called The Invention of Hugo Cabret, written by Brian Selznick. The massive 550-page book contained a great number of illustrations to help tell the story, and much of that look and feel was brought to the movie. 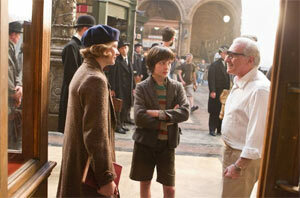 Hugo is not only Scorsese’s first time working with children actors as his main characters, but it’s also his first time working with 3D technology. Although Scorsese may be getting his feet wet with the family film genre here, he’s done a marvelous job creating a whimsical world for Hugo Cabret, and the people he comes in contact with at the train station, to exist in (the set design is fantastic!). 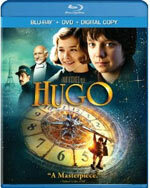 But thematically, Hugo has the feel of being perhaps too serious or heavy at times for most children to really enjoy. Hugo feels more like a kids film for adults needing to reconnect with that sense of wonder they may have experienced as a child and have since lost. Brokenness is a major theme in Hugo. The title character is a young boy who has been orphaned by the loss of his parents. After his clockmaker father’s passing, Hugo was looked after by his drunk uncle Claude who tended the clocks at a train station. Since then, Hugo has resided inside the catacombs of the train station, watching passerbys and workers at the station, all the while trying to steer clear of the Station Inspector who is trying to catch any stray children or thieves. Before his father died, the two were trying to repair an automaton figure that his father had found being disposed of by a museum. Since his passing, Hugo’s main purpose has been to repair this mysterious automaton, which his father had believed had the ability to write. While attempting to swipe something from a toy shop owner’s counter that may have parts he could use to fix the automaton, Hugo meets the owner named Georges–a troubled and bitter old man who regarded Hugo as nothing but a thief. But as the lonely orphan begins to spend more time with Georges, meeting a young girl named Isabelle who also works at the store in the process, the shattered pieces of his life slowly begin to fall into place. Hugo’s job as a clockmaker is to fix things, and with the loss of his family, he finds himself broken in a way he is unable to mend. Not only that, but he meets someone who he discovers has been broken in a way he doesn’t quite understand, but can relate to. It’s a truly touching story about purpose, brokenness, direction, family and self-sacrifice. 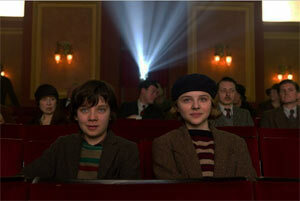 What I found to be completely unexpected about Hugo was that the movie is very much about moviemaking as well. About midway through the film, the story shifts its focus to a real-life filmmaker who was the grand inspiration for cinematic special effects and wizardry through the ages. I won’t divulge too much as not to spoil some intriguing developments in the story that I found to be nice surprises myself, but what I learned after watching the feature film is that Hugo is a marvelous blend of fiction and nonfiction. The life of this revered filmmaker really played out in similar ways as depicted in this movie and Scorsese pays wonderful tribute to him, even by recreating things like the man’s original studio and movie set pieces he used. Scorsese even works actual footage from the original silent films into Hugo seamlessly, making the story feel even more genuine. In the end, Hugo is just as much a love letter for movies and the birth of filmmaking as we know it as it is about Hugo Cabret’s journey. The casting for Hugo is excellently chosen; Asa Butterfield, who has starred in films like The Boy In The Striped Pajamas, Nanny McPhee Returns and The Wolfman, was an inspired choice to play the title character. He has the look and even some of the screen presence of a young Elijah Wood, and he has just the right acting chops to carry the film. Chloë Grace Moretz, who is a young actress seen in films like 500 Days of Summer, Let Me In and Kick-*ss) is a great match-up for Butterfield as she plays Isabelle. Ben Kingsley is fantastic as Georges, providing a well-rounded performance for a pretty intriguing character. Jude Law is under-used as Hugo’s father, but he adds a lot to the brief scenes he appears in. And Sacha Baron Cohen is a curious choice for Station Inspector; while he certainly does a good job mixing humor with the right amount of intimidation to make his villainous character one you can be sympathetic toward, given Cohen’s reputation as eccentric and something of an ego-maniac, he seems sorely miscast for such a role in a film like this one. He actually seems to be the only main actor that fits in what could be a children’s comedy, but luckily he doesn’t overdo his performance too much, as it seems Scorcese was able to keep the actor on a short enough leash, so to speak, to make sure he doesn’t go too far over the top. Hugo‘s content is pretty mild, especially for a movie made by Scorcese. The only profanity is one use of “Oh my G-d” by a peripheral character, and there is just some mild innuendo heard as the Station Inspector talks to the Police Chief about whether or not the baby his wife is pregnant with is his or not. The main content to warrant some caution would be violence. None of it is especially brutal or very offensive, but there is some manhandling of the children by the Inspector as he tries to eradicate the presence of any orphans or thieves from the train station. We also see a major train accident tear through the station (which turns out to be a dream sequence), which interestingly enough, was inspired by an actual photograph of an event that took place at this real-life Paris train station in the late 1800’s. But because the old silent films focused heavily on dream-like imagery, some of the imagery shown may be a little creepy or disturbing to some younger viewers. Also, the automaton itself is a bit creepy; it’s a metallic figure with exposed clockwork insides and a face that bears a human-like quality. Finally, there’s a scene where Hugo awakens and opens his shirt to find that his chest is filled with the same inner-workings as the automaton. And as he jumps out of bed in horror, he finds that one of his legs is also mechanical as the rest of him slowly turns into the automaton. He then wakes up again, revealing it was just a nightmare, but it’s a pretty intense–albeit short–sequence that younger ones may be scared by. 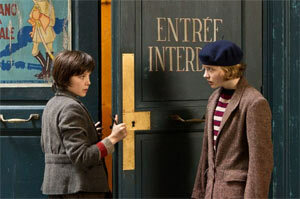 Hugo is a fantastic film for anyone who enjoys a good drama with a dose of whimsy for good measure. Scorcese tells the tale with a sense of childlike wonder that is infectious. The themes are easily relatable, while any lovers of film in general will find a lot to enjoy about this particular movie. Also, knowing that a good portion of the story is inspired by some true events makes the film all that much more worthwhile. I’m afraid its more mature storytelling approach may potentially bore children hoping for lots of action and excitement, but that shouldn’t dissuade older kids or adults from seeing this wonderful film. It’s truly an excellent story and a rewarding experience and one of the best that 2011 had to offer. The Cinemagician, Georges Melies (15:41) is dedicated to the real-life filmmaker Georges Melies, one of the first real filmmakers ever. Here we learn a lot about Melies’ life and how he discovered all kinds of unique camera tricks that had never been done before and had virtually been a magician with filmmaking. We see all kinds of shots from Melies’ real films as well as clips from Hugo with cuts of Kingsley and Scorcese talking about the beloved filmmaker. The Mechanical Man at the Heart of Hugo (12:45) is a fascinating documentary based on automatons designed by human hands all throughout history. It then focuses on the one featured in Hugo and reveals that it really does draw the picture that you see it draw in the film. It’s truly extraordinary. There is some pretty creepy imagery shown in this featurette though, as some of the original automatons were quite eerie looking. Big Effects, Small Scale (5:55) – This explains how they created the dream sequence train crash seen in the film. What you may not know is that it’s based on a real-life photograph that was taken in the 1800s of a train that really did go through the front of a train station in Paris. It’s a great featurette and really interesting to see how they accomplished recreating it by using miniatures. Sacha Baron Cohen: Role of a Lifetime (3:33) – This is a silly, brief featurette about Sacha Baron Cohen’s role as Station Inspector. It’s tough to tell whether what Scorcese and some other production folks say about working with Cohen was true or not, but basically they say he never listened to Scorcese’s direction… ever. It apparently was to the point where Scorcese had to tell him to do the opposite of what he actually wanted because Cohen would naturally do the opposite of what he was told. Cohen puts on a silly voice during the interview he does for this segment and doesn’t seem to speak a lick of truth. It’s entertaining, but you have to wonder if Cohen is as much of a jerk in real life as he seems to be in all of his outrageous performances and behavior (from Borat to his upcoming role as a dictator). Alcohol/Drugs: Hugo’s uncle appears very drunk when we first see him. In the next scene, we see him sitting in his place drinking; We see Claude lying on the ground with a flask being pulled from his jacket. Violence: Georges grabs Hugo’s arm forcefully and Hugo tells him he’s hurting him; Station Inspector and his dog chase Hugo through the station. Hugo falls onto someone’s table in a booth, smashing some plates and glasses before continuing to run away. Inspector comes sliding in and crashes into a band, destroying the double bass. He then continues to run through the crowd, shoving people out of the way. His leg brace then catches on a train door and he’s dragged along the landing; A man opens a door as fire comes flooding up the stairs and engulfs him. We later hear the man was killed; A dog bites a man’s pant leg; Station Inspector grabs a child by his leg with a rope and then grabs him by the arm and sticks him in a cage in his office; We see a very old film where a man is dangling off the side of a building and a clock; Isabelle falls in a crowd and is almost trampled; Hugo bangs a workbench in his home with his fist and and throws something to the floor out of anger; We see old movie footage of two boxers fighting as well as a cowboy firing at the screen; A train almost hits a boy and goes off the tracks and crashes through a station, sending people diving out of the way for their lives, but we learn it’s all a dream; There’s a creepy dream sequence where Hugo opens his shirt and finds that his chest is filled with gears. He stands up and slowly turns into a mechanical robot; We see a dead man lying on the ground (it’s not gory or scary); We see an old film where a rocket goes into the eye of the face on the moon (we see this several times) and we see some characters chasing after other characters; We see a prop dragon on set during the filming of a movie and some men with weapons who then attack it. Then there are some dancing skeletons who disappear when those men swing their swords at them; We see some imagery from the war with explosions and cannons; We see a flashback of a man burning old film sets; Inspector grabs Hugo and drags him by the shirt; A person is nearly crushed by a train; We see some bizarre, dream-like imagery in some old films that includes dancing skeletons and such.